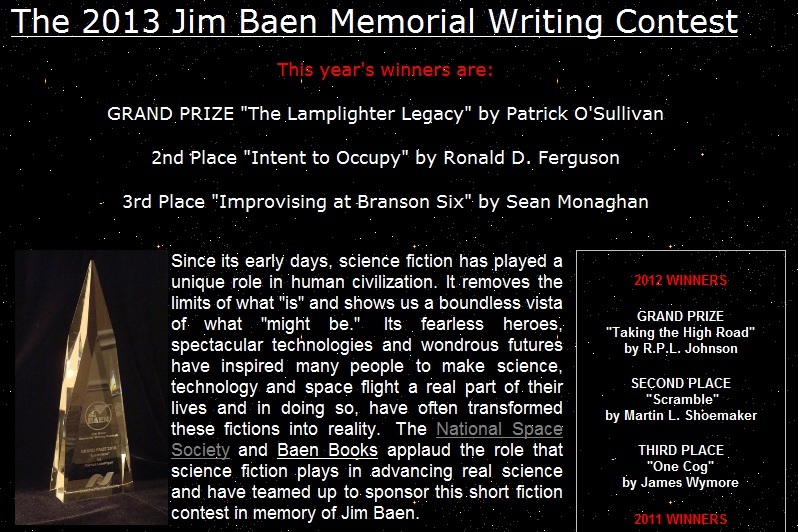 The results have been out for a few days now – my story “Improvising at Branson Six” placed third in the 2013 Jim Baen Memorial Writing Contest. I’m pretty thrilled. I’ll be looking for somewhere to publish the story sometime. Well done Patrick and Ronald. This entry was posted in fiction and tagged jim baen, science fiction, short story, writing contest on 19 March, 2013 by Sean Monaghan. Super congrats, Sean. That’s a good way to start out the year, and I’m sure you’ll have no problem at all publishing that winning piece. What fabulous news, congratulations. I look forward to reading the story. Wow, awesome. Real happy for you, Sean.